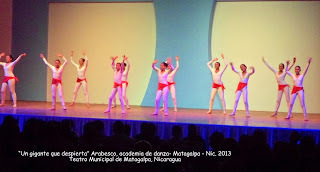 EL PASADO VIERNES 6 DE DICIEMBRE, EN OCASIÓN DE LA JORNADA INAUGURAL DEL TEATRO MUNICIPAL DE MATAGALPA Y EN SALUDO A LAS FIESTAS NAVIDEÑAS, ARABESCO ACADEMIA DE DANZA ALTERNO ESCENARIO CON LOS INTEGRANTES DEL ELENCO ARTISTICO DE LA ESCUELA NACIONAL DE BALLET DEL INSTITUTO NIC. 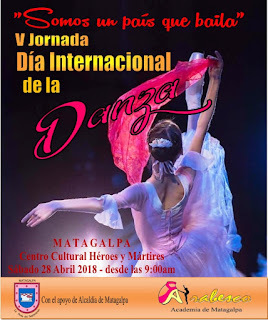 DE CULTURA. - ÓRGANO RECTOR DE LA CULTURA NACIONAL. 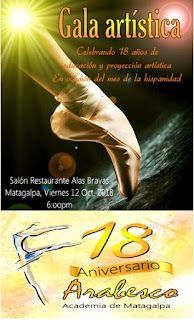 UN ENCUENTRO EN EL QUE AFLORARON LA TECNICA Y EL VIRTUOSISMO CON LA TECNICA DEL BALLET CLASICO. 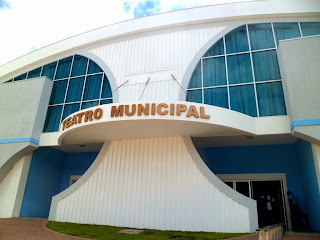 EL MAESTRO WILLIAM HERRERA Y MARCOS VALLE, AMBOS DIRECTORES Y COREÓGRAFOS DE LOS ELENCOS MENCIONADOS, DIERON SU BENEPLÁCITO A LA LABOR DE PROMOCIÓN Y DIFUSIÓN DEL ARTE HACIA LA COMUNIDAD QUE BRINDARON LAS AUTORIDADES MUNICIPALES EN ALIANZA CON EL I.N.C - CON LO QUE SE DEMUESTRA LA PROYECCION ARTISTICA DE EXCELENCIA A TRAVES DEL BALLET.